Ever stare at your grilled chicken breast and wonder what you can do to make it more exciting? I love grilling chicken, but I find myself getting into a rut of what I put on it. This sauce is super easy to whip up and can be made while you’re grilling the chicken or ahead of time and kept in the fridge. The intensity of the curry powder pairs well with the brightness of the lime juice and makes a plain ole chicken breast way more exciting and flavorful! Plus, the creamy sauce makes the chicken moist, so you don’t have to worry as much if you get distracted talking to those around you! In small bowl, whisk together the sour cream and lime juice. Add in the curry powder, garlic powder, and onion powder. Whisk until well-combined. Spoon sauce over chicken. Enjoy! I am always looking for a good grilled chicken recipe. Thank you for sharing this, Jessica! It does look delicious! Thanks, Anna! You are too sweet! I appreciate all of your thoughtful comments! 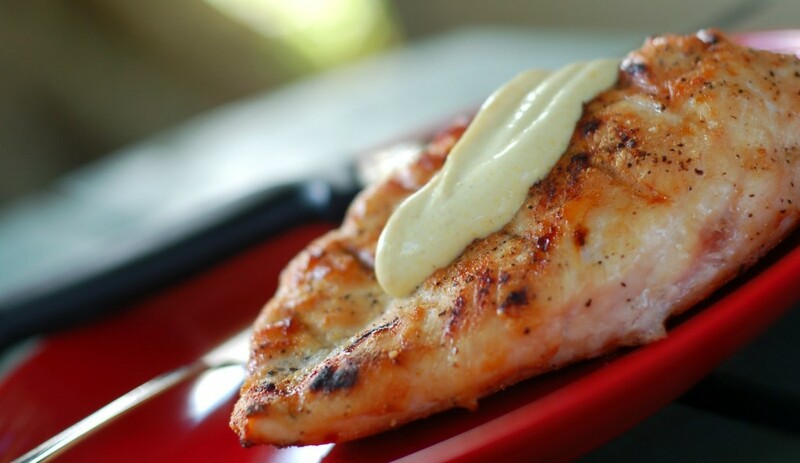 I love simple sauces for grilled chicken like this one – It looks like a mouthwatering combination! Great recipe, Jessica! Thanks! Let me know what you think of it, if you give it a try! Grilled chicken is always a must in our house and this sauce sounds so great. I love the curry combination with citrus. Love it! Thanks! We’re always eating grilled chicken, so I’m trying to find ways to mix it up a bit! Chicken breast does get old but I think I miss grilling so much I have a few more attempts before it will hit me. This sauce sounds wonderful. I hope you’ll be able to give it a try sometime! I love grilled chicken. This sounds like a tasty sauce to serve with the chicken. I love the combination of ingredients. Thanks! We definitely like the flavor that the sauce brought! Thanks! Let me know what you think of it if you get around to making it! Curry lime sauce sounds great–and easy too! Thanks! I love how quickly I can throw it together!